Gray skies and light rain could not dampen the spirits of the approximately 400,000 individuals who turned out for Chicago's 37th Annual Gay and Lesbian Pride Parade, held June 25. The parade kicked off on time, with the lead car occupied by out actor George Takei, the grand marshal. He was followed by dozens of politicians, including Democratic Illinois Gov. Rod Blagojevich and Republican Judy Baar Topinka, who are both contending in the gubernatorial race that will be decided in November. Other officials in the parade included U.S. Rep. Jan Schakowsky, Illinois Lieutenant Pat Quinn, State Rep. Sara Feigenholtz, Cook County Commissioner Mike Quigley, Ald. Tom Tunney, Ald. Helen Shiller, and many more. 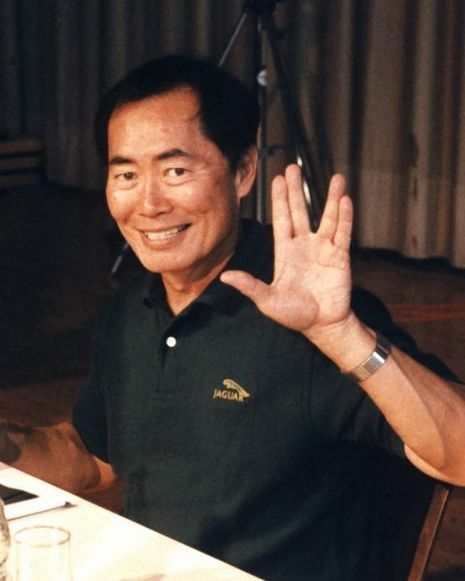 Chicago, IL — George is best known for his portrayal of Mr. Sulu on the classic television series, Star Trek and in six subsequent Star Trek films. He made international headlines when he came out to the public last Fall. This Spring, he embarked on a national speaking tour as a spokesperson for the Human Rights Campaign (HRC) Coming Out Project during which he shared his story and encouraged others to talk about their lives as well.